…it goes without saying that nothing concerning art goes without saying. What is contemporary art? When we engage this gigantic question, we’re thrust into an enormous labyrinth of possible conclusions. How to define or even describe the hydra-headed beast with the elusive name? But first: What is art? Art is usually defined as a man-made object (&/or idea) of aesthetic concern/beauty. Concern & beauty are separated to demonstrate that art does not have to be beautiful, but it usually carries with it an aesthetic “concern”. This concern can be many things at once (including beauty). An aesthetic concern might be “absence” or “uniformity” as demonstrated by an all-white painting–think Robert Ryman & his explorations of this singular motif. Another aesthetic concern may be how far to push the limits of taste. An artist who recently passed-away, Dash Snow, constantly pushed the borderline of acceptable taste & conventions with his revolting glittered newspapers & other artistic-spasms. And yet another aesthetic concern (from any number of possibilities) could be, the great Marcel Duchamp’s (now) mythical questioning of art itself with his “Fountain.” The question itself (What is art?) takes precedence when looking at Duchamp & of course all of CA. One might see it as a kind of game, indeed a game we are still obsessively playing. Can art be a set of instructions for a painting by Sol Lewitt? What about getting shot in the arm, as with Chris Burden’s “Shoot?” In these examples, art is an idea & an action. What about the Prada shoe-store in the middle of the desert by the artists Elmgreen & Dragset? We see that the questions lead in many directions, everywhere & all at once. The questioning of the definition of art itself is one that is continuously asked & redefined. I presume the question will not let go anytime soon & it is a characteristic trend in CA right now. Thinking of Duchamp, another term stubbornly attaches itself & will not let go—the avant-garde. The avant-garde & its relationship to CA, is a fundamental artistic tradition as well. Understand that the avant-garde tradition is well-worn—and these days, the tradition is tinged with irony. The avant-garde would be the artists I discussed above, & for example, an artist like Olaf Breuning who delights in offending good taste & common conventions around the topic of what is good art and what is ugly or bad art . . . Remember Christoph Büchel’s interiors that drag the viewer inside the mind of the homeless, the neurotic & so on. Quite a contrast from what you see above by Sol LeWitt. Think also of Wim Delvoye’s digestive machines, Cloaca, that replicate the digestive process. These examples should give a general sense of the avant-garde as a trend in CA. A term that I want to attach now is hermeticism. Although the term is not used widely, the concept (or trend) is rampant & omnipresent in the general practice (dare we say praxis) of CA. Hanne Darboven’s art is a good example of hermeticism. Her counting & examinations of time are vivid reminders of her inscrutable art. The multi-faceted installations of Cosima von Bonin can be hermetic, with her personal references, cultural hints & often opaque meanings, done in a visual language that’s not always clear. Matthew Barney is also emblematic of the hermetic, in particular his “Cremaster Cycle.” The prevalence of coded signs & hidden meanings may signify that contemporary art (as part of its general aesthetic) has a sense of mystery, the unknown, and the enigmatic. Hermeticism in CA is endless & overloaded—it’s part of the game! This nuanced entrenchment of the unknown is CA’s beauty. Keep in mind that a sense of beauty in art is impossible to pin down. CA also demonstrates how the concept of beauty is many things, to many people. Think of Thomas Demand’s photographs as distillations of reality, with his paper versions of historically accurate scenes. That’s beautiful to some, yet confounding to others. The beautiful is not absent from CA’s discourse, but as the meaning of art is consistently questioned, so is the meaning of beauty. Now that we’ve touched on some trends & ideas, let’s not forget a few more important ones. Pop-art, for example, and its legacy. Some refer to this as Post-Pop Art, including everything “after” Andy Warhol, Roy Lichtenstein &c. Here I find someone like Shepard Fairey as an inheritor of the tradition, down to his use of popular imagery as source material. Jeff Koons embraces & evokes consumer (pop) culture with his finely tuned, over-polished & highly desirable objects, while at the same time embracing the whimsical & mundane. Koons’ working method also reflects Warhol’s factory & thereby mimics a mass-produced, made-to-sell product. With this trend we also have questions of authenticity, originality, piracy, the copy &c. The Post-Pop trend questions art-world hierarchies, such as high-brow vs. low brow. Recall Cady Noland’s engulfing cans of Budweiser, walkers & Charles Manson groupies. So the Pop legacy is everywhere in CA. Yet another theme emerges that shouldn’t be overlooked: specialization. As Koons was a good example of the Post-Pop Art tradition, his work also touches on the theme of specialization. Specialization is linked to the sciences, as with Olafur Eliasson’s experiments with light, weather, water, sound &c. Also think of Mark Dion’s courting of the (natural) sciences to expose a deeper meaning from the work of science, while critiquing it, all at once. Damian Hirst too, consistently exemplifies specialization. Just think of his famous vitrines & pseudo-pharmacies. All of that work requires an array of experts & specialists to get to the final product. No doubt, the CA object is subject to the forces of technology & innovation, exploring the boundaries of science, art & commerce. The repurposing of everyday objects is also an important CA trend. Who could forget Tom Friedman’s cereal boxes or his colored-paper traumas? Tara Donovan’s epic statements with 1,000’s of plastic cups or drinking straws, surely speak to this ever-morphing trend. CA is pluralistic, divided & contradictory. This multivalent quality is also a trend. The photo-realism & abstraction of Gerhard Richter provides a good example. On one hand you have the fantastic manipulation of the painted surface with his abstractions. At the same time we can appreciate the subtlety of his gentle life-like candle or flower photo-realism. Speaking of slightly schiziod (with a dollop of irony) we should look at Martin Kippenbeger. Kippenberger aligned himself with a kind of quantity-over-quality aesthetic, while at the same time dazzling us with his multiplicity. His art is like a DIY-CA group show, composed on a heroic scale. It is probably worth it to bring in Joseph Beuys as an example of trying to be all things, to all people: teacher, artist, mystic, everyman &c. His art appears to be hermetic, divided, avant-garde & questioning. Beuys might be the paterfamilias of CA. He helped lay the groundwork for what was to follow. He can’t be forgotten. It should be clear by now that we’ll never come close to explaining the complicated terrain of CA in all its fascinating fits, miasmas & emulations. We see that CA is about questioning, taste-issues, the avant garde, beauty, irony, contradiction, plurality, the everyday, originality & so on! Art is a reflection of our society & whether we look at ourselves through its lens, or our own—we are still mystified & perplexed. Perplexity can cause us to question. After reading this, pick up an art magazine, flip through it, look at the ads & read an article. Or if you’re around an art gallery, or museum showing CA, drop in & look around, see what you like, learn a little more about it. Look up an artist online, keep going, and indulge your curiosity. Contemporary art isn’t slowing down, painting is not dead, and the end of art is not upon us. Why would anyone stop making it? Why would anyone stop looking? [i] I see Duchamp as a forefather to CA, however his art not usually considered to be CA-proper. His influence on CA cannot be underestimated. [ii] Chris Burden probably wouldn’t call himself a conceptualist, but we’ll use him here as a proxy, a stand in for the conceptualists (where the idea was everything). Sol Lewitt’s instructions are probably a better example. [iii] A few of the examples (artists) were also considered minimalists, (Ryman, Lewitt, & Burden: also known as a performance artist). Duchamp: also is a modernist might be known as a Dadaist (& even a surrealist to some). Elmgreen & Dragset may also be said to work in a minimalist vein, & are still more broadly known as CA (contemporary artists). Classifications that were once fashionable are usually no longer used. Typically critics no longer use the ‘isms, better yet, no new ‘isms are used, only the “old” ones: modernism, post-modernism, minimalism, conceptualism, Pop-art &c. The old terms are used, but usually only as something that has past. Rarely do you read about any new “movements” in art, they seem to be a thing of the past. You will however, hear about trends (or genres) such as video, performance, craft, goth, graffiti-art, globalization digital art &c. To be clear, classifications now usually tend toward the most general art terms: painting, sculpture, video art, performance, installation &c.
[iv] The avant-garde was usually an affront to tradition in the 1st place. Funny that it is now a tradition. [v] Not to be confused with mystical hermeticism, but my use of the term does share aspects of it: esoterica & the like. Also look at Secret Society. [vi] Hanne Darboven (1941-2009) sadly passed away this year. Here is an obit. from Artforum. She is known as a conceptualist. [vii] Theodor Adorno speaks at length on the notion of the enigma in art. David Ferris helps to understand Adorno’s concept in this paper. Adorno’s use of the term Modernism can also apply to CA. [viii] Fairey’s practice is also related to appropriation art which in turn also has a strong link to Pop art. [ix] Look at Predicting the Present. [x] Hirst’s diamond skull “For the Love of God,” is famous for pushing the boundries of commerce & art-practice. [xi] Now we’re back to Duchamp & his readymade ideas, now everywhere. [xii] …of course Joseph Bueys was considered by some to be a fluxist, but he can also be a conceptualist & performance artist. 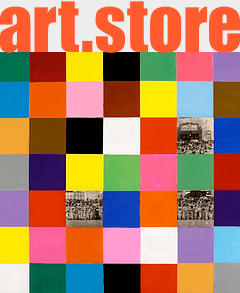 [xiii] Art in America, Artforum, Frieze, Art Review, Flash Art, Modern Painters, &c.